Going on road trips with the family is fun—but it can also be stressful. This model, entrepreneur, and mom of three shares the practical tips and life lessons she's picked up along the way. Some parents anticipate travel as time away from the kids, but for multitasking mom Mikaela Martinez and her husband Chucho, traveling with their kids Noelle, 14, Tyler, 10, and Maxen, 2, is a welcome and rewarding experience. "We go on road trips a lot. We try to book a trip every month. We've been discovering so many nice places in the Philippines that you can drive to. We've reached Bataan. We've been everywhere in Batangas and Laguna," says the model and entrepreneur. Traveling allows the family to bond and spend quality time together, which is becoming more important now that the two older kids are starting to pursue their own interests (Noelle has her own vlog on YouTube, while Tyler is deep into basketball training). Traveling is also a way for the young mom to soak up many life experiences with her three children—and learn a few valuable lessons along the way. Here are a few things she's realized while going on road trips with kids. Small comforts can go a long way. Luckily, it doesn't take much for Mikaela's kids to settle in during a long car ride. "As long as we have good air-con and music, they're fine," says Mikaela. "That's the formula: music and good air-con and a comfortable ride—soon they'll fall asleep." She also makes sure to bring things that can distract Maxen. "My youngest loves books and music, so I always make sure to bring his books and play his favorite songs in the car. And juice. Juice always works." Practice safety inside and outside the car. 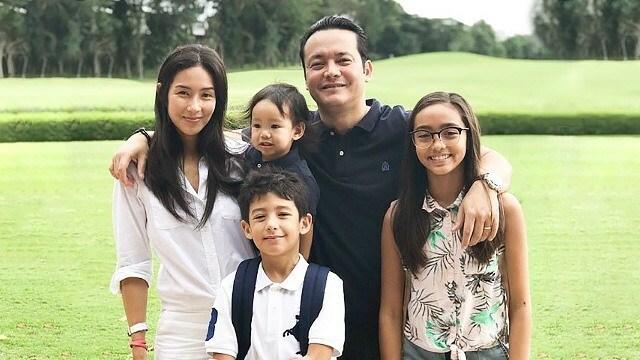 Car safety is one of Mikaela's main concerns as a mother, which is why she has agreed to sign up as one of the mom-bassadors for Ford Philippines' family and road-safety advocacy. Ford highlights the dangers of distracted driving, especially among parents, through its Driving Skills for Life (DSFL) program, which trains drivers to keep their eyes on the road and their hands on the wheel. Ford also ensures that families get home safely with its class-leading vehicles that are packed with safety features. Mikaela agrees with Ford that everyone should have their seatbelt on even if they're riding in the back, and that car seats for kids top the list of safety requirements when driving. Mikaela is also an advocate of the #ParkYourPhone movement. "I try not to pick up my phone when I'm driving. All it takes is one mistake, and I don't want to be the one to cause it." She also has a personal preference when it comes to the best car for ferrying kids around. "I really like SUVs because I feel safer. [They're] higher and more stable and sturdier especially when you have kids in the car and you're surrounded by buses and trucks and motorcycles on the road." Patience plus creativity always wins in the end. Traveling with toddlers can be a daunting task, mostly because they're still getting used to their body and testing the limits of what they can do. "My youngest has this thing now where he loves to tumble. He'll do it everywhere, and it stresses me out especially when we travel," Mikaela says. "We tell him to stop but have to give him an alternative. Instead of tumbling, we tell him, 'Why don't you jump instead?' I can't just tell him 'no.' I have to give him a safer alternative and show him what he can do so he'll follow. That makes it easier for us to bring him around." Family life is more fun when you're doing things together. Mikaela takes advantage of car time to catch up with her kids and to engage them in simple yet fun family-friendly activities. "There are a lot of things you can do in the car. The older kids can sing together," she says. "I encourage them to tell stories, and sometimes you even have to let them bicker. That's part of the bonding process while traveling in a car." Your kids will surprise you. "When I travel with my kids, I realize how grown up they are and how mature they've become. I get impressed with how they take care of each other. The older kids step up, and I sometimes think, 'Wow, who are you?' All of a sudden, they're helping each other and taking care of the little one. They just really step up when we travel."